A beautiful photo is one thing, but a photo with an unexpected detail has personality and pop. This week, share a photo that has a little something extra. 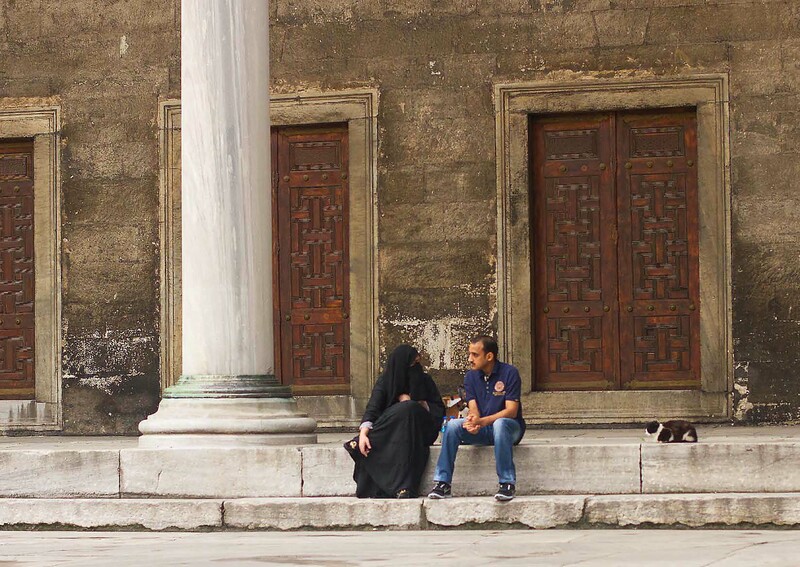 "Third Wheel at the Blue Mosque," by Michelle Weber. “Third Wheel at the Blue Mosque,” Michelle Weber. Istanbul has many stray cats freely roaming the old city. This black-and-white fellow was also frequent a visitor to the Blue Mosque and was keenly interested in what these two had to say (or perhaps the snacks they had in their pockets). Over the course of ten minutes he crept ever-closer, an adorable eavesdropper. I would have taken this photo had he not been there, but the presence of an interesting extra made this shot all the more irresistible. This week, share a photo that has a little something extra: an unexpected visitor, or a tranquil landscape with a splash of color. A lone carrot in a sea of peas. Draw us in with a humorous detail, or find a photo with an added element that makes it an image only you could capture. If you’d like, go broader and show us a thing or place you think is an extra — a thing you could do without, or a place that’s not part of your day-to-day life but has meaning for you. Excellent — I’ll see what I can come up with this week! I love extra moment that pop up a photo!! Are you sure “Yash”? Bali is a unique island, isn’t it?. But why always about Bali. We have more than just Bali. Actually, our country has many interesting destination for tourism. So many cultural, the beautiful beach, ancient heritages and more. Great theme and shot! So many ways to go! Your photo post is both intriguing and fascinating. …. Extra thanks to WordPress users and “likers”: Broken Light: A Photography Collective, milfordstreet, blueberriejournal, Aradhana Anand, imexcited, aregularjo, mrs4chin, raypho, Leanne Cole, gcharb, ichocute. Love Turkey and its cats. Hope you had a great trip! In this picture is so much EXTRA! Did it just this morning great topic Michelle. This was an extra moment for me because it was the first time I saw and captured a hummingbird up close. Fascinating shot! It tells an intriguing story. Lovely scene, Istanbul is my favourite city. That cat adds such an element! I will have to see what I have. What a great challenge. A very interesting and intriguing image. Janet, you are always so kind to find working links! Thank you! 468 Responses While this challenge is closed to new entries, we encourage you to visit the Reader to find other avid bloggers. Shots and captures Weekly Photo Challenge: Extra, Extra. Behind the Willows Weekly Photo Challenge: Extra, Extra! Crap I Blog About It’s pure magic! Babsje Heron Extra! Extra! Read all about it! Travel Monkey Weekly Photo Challenge: Extra! Extra! Pursuing The Void Weekly Photo Challenge: Extra, Extra – Can You Stop Him Runnig? Zeebra Designs & Destinations An Unexpected Visitor? small house/BIG GARDEN Weekly Photo Challenge: Extra, Extra! LenzExperiments Weekly Photo Challenge: Extra Extra! Walk to Market Colourful silk strands…extra. Summerfield84's English blog Can you see Mt.Tsukuba ? Melanie Ryding – Ryding2Health BLOG Photo challenge: something extra! Thinking Through My Lens Exploring Natives…and Some Extras! The numpty with a camera and a laptop WPC – Extra floaty. Perhaps yes, perhaps no. Exactly? I don't know. Weekly Photo Challenge: Extra, extra? This guy. What Katy Photographed Weekly Photo Challenge: Extra, Extra. iMAYAgination Who’s Looking at Who? Tales of a slightly stressed Mother! That little extra something. The Syllabub Sea Extra! Extra! Southern Sea Muse Weekly Photo Challenge: Extra, Extra! Anawnimiss of a view. and then some. Lillie-Put Weekly Photo Challenge: Extra! Extra! greatsnaps, goodtimes and me Sand Blast! A Simple Note A Mount View with an Extra Caught! Restawyle WPC – Extra, Extra. Mary J Melange Extra Pillow? The Urge To Wander Solo In Venice! castelsarrasin Weekly Photo Challenge: Extra, extra! ilargia64 WPC: Extra: The unexpected visitor!!! !